I asked Billy Owens for an interview for the web site and he was only too happy to oblige. We spoke for about 4 hours at his home and it only seemed like 1 hour. His knowledge of West’s during the Kelly’s Kids years is exceptional. 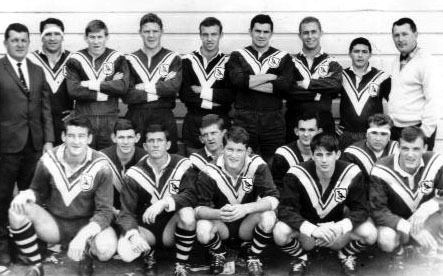 Bill was the coach of third grade in 1966 then reserve grade from 1967-1969. He coached many good players during those 4 years. 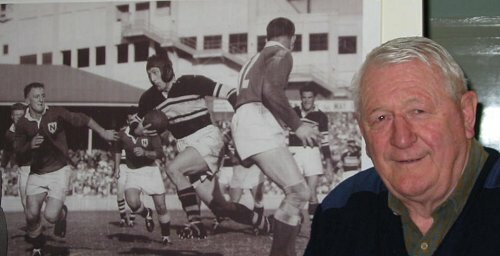 Bill played for West’s between 1954 and 1957 and 1960; he also played one season with Canterbury in 1958. He then had a very serious shoulder injury which put paid to the 1959 season. 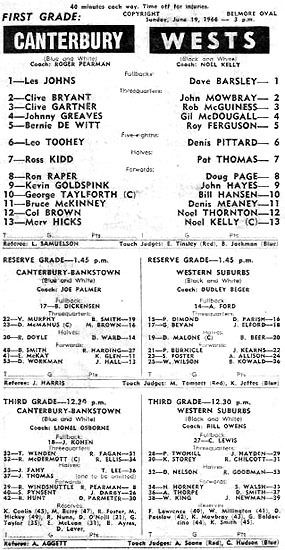 In 1960 he played only one game for West’s. He then started to coach third grade at West’s in 1964. If you look at the photo above you will see Bill making a break at the SCG. Can you recognize the Newtown player about to tackle Bill? Yes it’s the great Johnny Raper. Did Bill get past Chook? Of course!! With Bill as the 3rd grade coach West’s were unlucky to miss the semis by only 1 point. They finished on 22 points with Parramatta on 23 points. 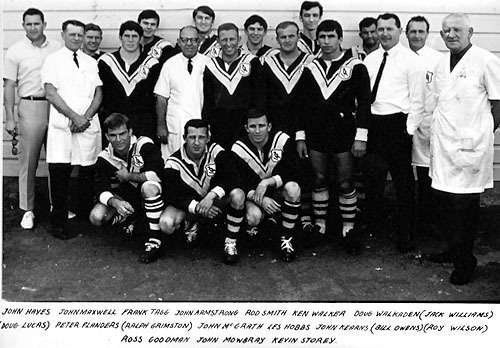 Some of the players from 1966 that Bill coached were Colin Lewis, Nev Hornery, the late Bruce Beer, Don Malone, Ken Mowbray, the Smith brothers, Tony Ford, Ross Goodman, the late John Armstrong, Brian Kowald and Tim Murphy (whose photos appear in the reunion page) just to name a few. Most were young local juniors with some old heads passing through either coming back from injury or suspension. 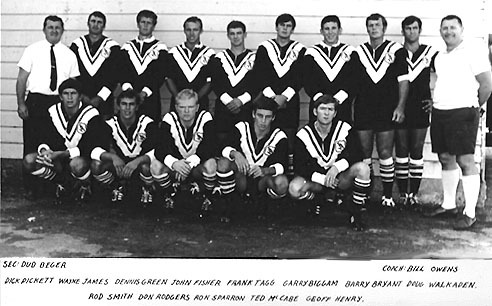 Bill coached reserve grade from 1967 until 1969 with mixed results. Bill told me that coaching reserve grade became a harder job close to the semis when some of Noel Kelly's side couldn't train. This meant losing in form reserve graders (often the captain) from training sessions and many times the next game. 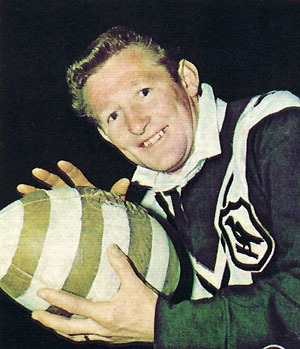 Bill remembers a young player by the name of Tom Raudonikis turning up out of the blue one day at Henson Park. Tom played a blinder, he played one more game in reserve grade and the rest is history. Maybe Billy’s words of advice that day made all the difference to the young kid from the bush. Bill and I talked about the good old days at Pratten Park and Lidcombe Oval as if it was only yesterday. Thank you once again Bill for your time and kindness in giving me a chance to go down memory lane with you. *Some recent news about Bill Owens and his family.